Hey up..! 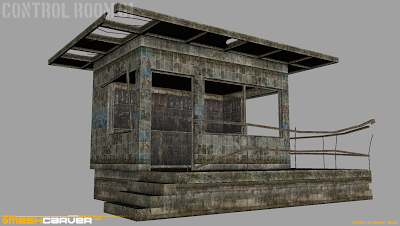 Here's another little structure, like a sort of Control Room for the railway or something, it's pretty generic so it can be placed anywhere really. I've started in on doing some serious weathering now, as this map will be set a fair few years in the future so things will be really worn and dilapidated, with exposed rebars and underlying frameworks etc. I think small details like the window frame fallen out, and the handrail twisted (From a stray grenade or anomaly..?) out of shape add to the overall atmosphere, but it will prove more time consuming to set these up to work with correct collisions etc in the ARMA engine.